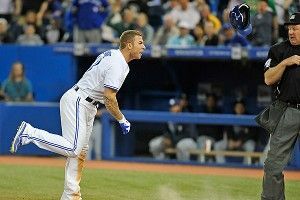 » Is Brett Lawrie the Boston Tea Party of the Robot Umpire Revolution? The Scene: Tuesday evening, ninth inning, classic Jays vs. Rays derby in the historic Rogers Centre. So much animosity. So much history. Greatest rivalry in sports. One out, Rays leading 4-3, and Jays third baseman Brett Lawrie is at the dish with a 3-1 count. A situation every kid dreams about, provided the kid has almost no ambition. of the other batter’s box. The 3-2 payoff pitch was marginally better, but still close enough to the first base coach that he had a Vietnam flashback. Lawrie might have been able to make contact if he had a second bat attached to the end of his first bat, but baseball hasn’t allowed that since Ty Cobb’s famous double-bat incident, when he attacked a group of men in the stands because they weren’t wearing American flag pins on their lapels. And yet, Lawrie got punched out, like so many brave men before him. Instead of taking it lightly, he went into a wild rage, throwing his helmet at the ground near Miller’s feet and watching it bounce up to hit the umpire in the hip. Look, I don’t condone negative behavior, even the accidental kind. (Scratch that — especially the accidental kind. I was accidentally bullied in school by a kid with Tourette’s who would accidentally insult me, and let me tell you, it was accidentally very painful.) Lawrie will certainly be suspended by Major League Baseball for his defiance, and that will be one kind of justice, if you’re into that kind of thing. I am, as long as the blindfold is involved. But here’s another important point: Umpires are terrible people. They make exclusively wrong calls. As part of the research for this post, I looked back in the umpire archives, and the last good call came in 1971, when third base umpire Arnold “Wrong Way” Riker forgot which way he was facing and correctly called a Willie Stargell grounder fair. My point: The men in blue are incompetent, and should be replaced by robots. In that context, I think it’s completely fair to compare Lawrie’s helmet toss to the colonials who dressed up like Native Americans and threw British tea in Boston Harbor. It could be the start of a revolution. * Hell, maybe Lawrie is a step above; he didn’t dress up like a Native American. I always thought that was a little cowardly. When you bring up the concept of robot umpires, a lot of people counter with the “human element” argument. The idea is that despite the blunders, baseball is a human game and must not go to the heartless machines. I completely agree. Which is why I think we need to program the robot umpires with human personalities. We’ll have one annoying umpire who makes really emphatic strike calls to rile up the crowd, another who dances with the mascot between innings, and a third who makes jokes about the players’ mothers over the PA. Think about how much the kids will love the zany umpires! And the best part is, they’ll never make an incorrect call. If they do, a technician will take them behind a scrim in the outfield and pour water on them until they start smoking and short out. Sure, this might be traumatic for some of the fans, but then again it might be a welcome diversion in the case of the annoying umpire. And then we can play baseball in peace. Call me an idealist, but I think Lawrie’s helmet toss into the Boston Harbor of Bill Miller’s hip was the start of something big. It makes me want to rent a horse and ride around shouting, “The blue coats are coming!” (And I would, if the government would relax their ridiculously stringent horse-renting standards.) So stick with me on this one, and don’t shoot until you see the whites of their blind, umpire eyes.